Spin The Lucky Wheel! - xxe8 Free Gifts For Everyone. Click on the website xxe8 dot com. Spin the wheels and win prizes. Ayupp Analysis – This is a fake website and created to gather traffic. 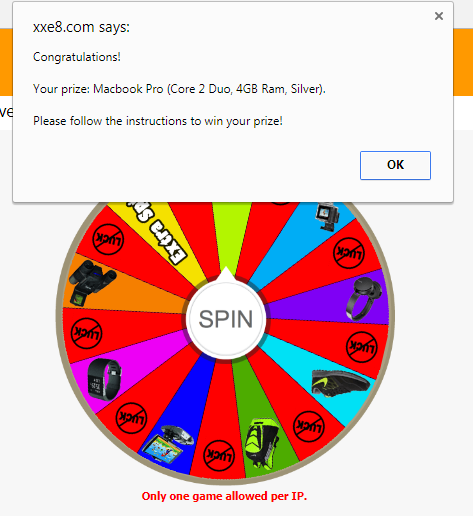 If you visit this site, user will be asked to click the spin button of the lucky wheel. 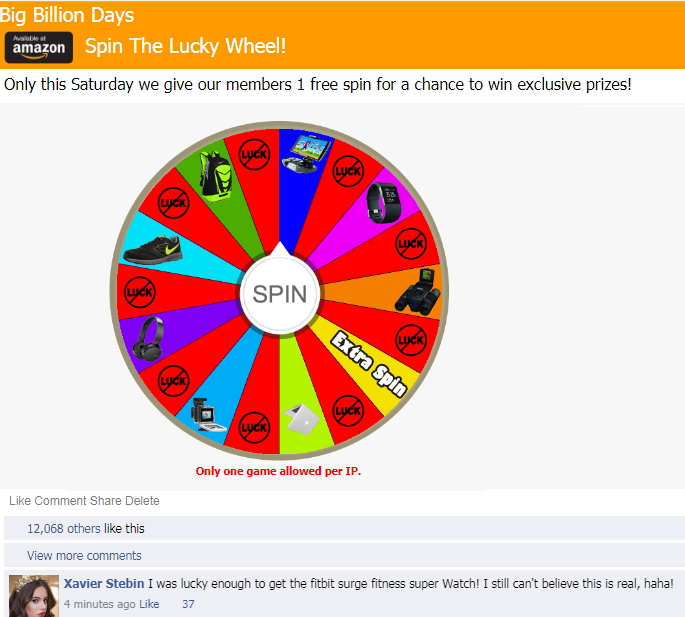 When user clicks on spin for the first time, he is informed that “You won 1 free extra Spin”. 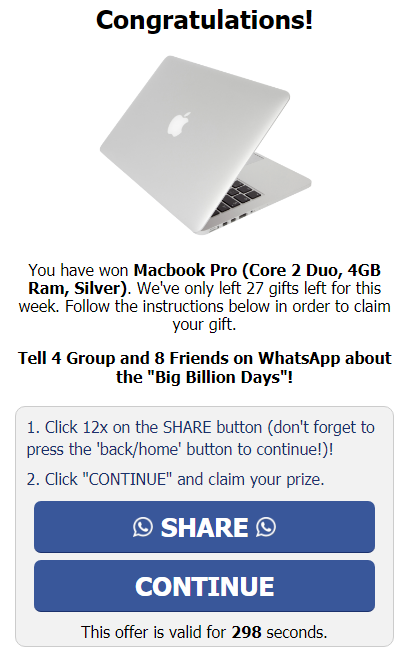 You have won Macbook Pro (Core 2 Duo, 4GB Ram, Silver). We've only left 27 gifts left for this week. Follow the instructions below in order to claim your gift. Tell 4 Group and 8 Friends on WhatsApp about the "Big Billion Days"! And finally, the user is asked to share it with 12 friends. Users are very happy that they have won something, in real time it is fake website. Although this website appears to be based in United States there are other countries involved and you should review this information carefully and decide if it is as you expect. This website is very new, and as such doesn't have an online reputation yet. As with all new businesses, we suggest that you take care and if necessary get in contact with the owners before placing an order of value. 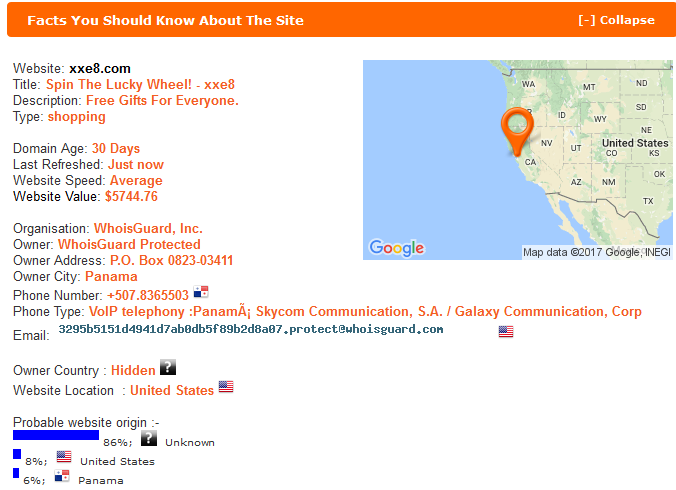 This site is using an anonymous service - which prevents us from identifying the site owner. This can sometimes be just so that the owner does not receive spam, but be aware that many scam sites use this as a method to hide their identify. If this is an ecommerce site - we would suggest you confirm the business address with the website owners’. No genuine company will ever hide its identity. Hence we term this message as hoax and fake. In fact this kind of messages are very dangerous and we can never be sure where it can lead us. So, be aware from clicking on such website. It can some program in your computer and infect it with some virus.